Tuna sashimi or maguro is a favourite with most sushi and sashimi lovers. 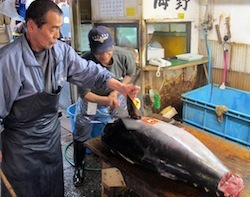 This tuna was removed from the cooler and is being prepared to be sent to a restaurant. 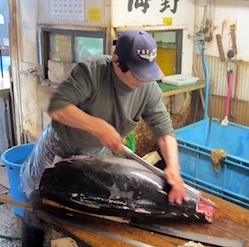 The fin will be removed from the tuna and these sharp knives (plus strength) is used to cut through the tuna skin and the soft meat underneath. 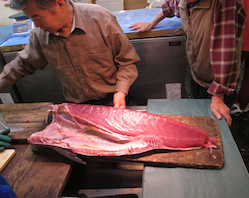 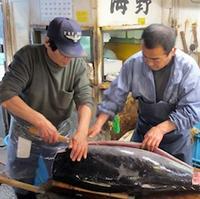 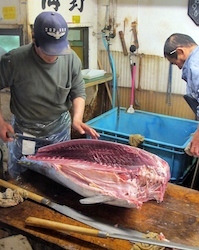 The tuna is sliced through the side of the fish from the tail towards the head. A helping hand (person) is used to finish the slicing. 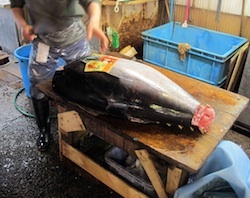 The flesh is removed from the fish. 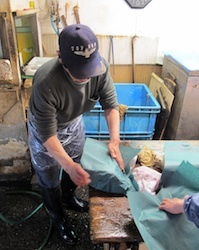 Tuna for sashimi and sushi is put in plastic bags and packed in green paper - the Tuna Wrap! 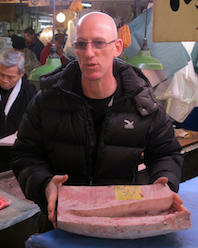 The tuna is stored in blocks in the freezer at minus 60 degrees celcius until being cut and packaged.